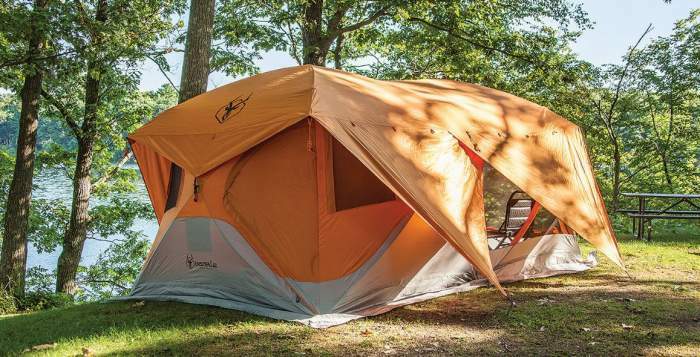 Gazelle 26800 T4-Plus Pop-Up Portable Camping Hub Tent is a very unique 2-room structure with a pre-attached frame and a semi-instant setup, a very tall tent with a removable floor. Gazelle 26800 T4-Plus Pop-Up Portable Camping Hub Tent. This tent is available on Amazon and I have noticed it in a couple of their global stores. So follow the link and check if it is available on your local Amazon store, you will save on shipping. 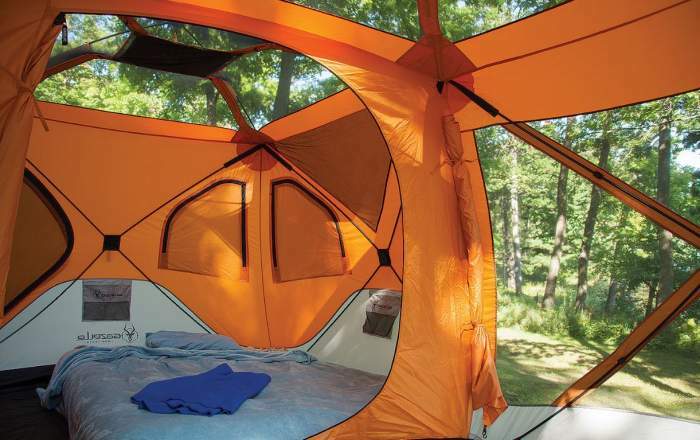 This tent is on the manufacturer’s site under the name Gazelle T4 Plus Hub Tent with Screen Room, and what you see in the title above is how it is described on Amazon. This is a quite unique structure with a pre-attached frame and a pop-up design which you have in all its walls and also on the roof. But there are still a few poles that you add separately as well as the fly. So I would not call it an instant tent in a strict sense, it is better described as a fast-setup tent. 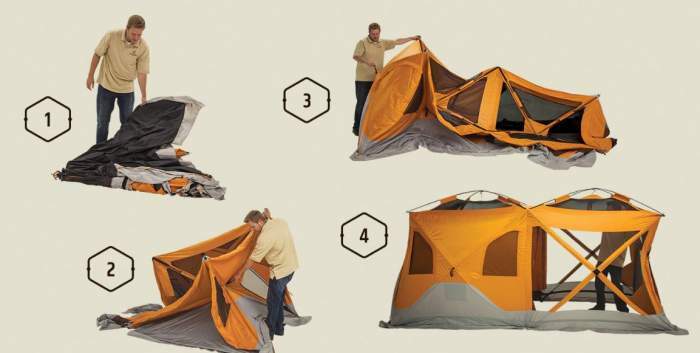 For true instant tents please check this list. They claim 90 seconds setup but this is not realistic. The pictures below describe some of the basic steps, but you still have to add a few poles at the door and the fly with some extra poles, you will see this in the video below. The setup procedure with the pre-attached frame. This is not a freestanding tent, bear this in mind. I have seen some claiming that it is, but it will collapse unless you stake it down properly. It is hard to put it any group regarding the shape, but it is closest to a cabin style shape. You have a 2-room tent here of a particular type with the front room which looks like a screen room and an inner room, both the same size and you have doors on both rooms. But you have panels on the screen room for privacy and protection, so this is more than just a screen room. Anyhow, I have added it to my list of tents with screen room. The floor is removable in both rooms, you have Velcro tabs running around the perimeter, plus hooks in the corners. This is good enough to keep almost all insects outside if the connection is done properly. Note that the floor goes up from the ground for some 3 – 4 inches so you are pretty much secure from any groundwater. There is also a skirt on the tent body, see the picture, which is around 6 inches wide that goes around and covers the area completely. This will prevent any possibilities for splashes that would get water in, so there is nothing one could object here. The skirt that goes all the way around the tent. Capacity-wise, the declared capacity is up to 8 people. But the area is 110 ft² (10.2 m²), so if used by 8 people this would give 13.8 ft² (1.27 m²) per person, without any extra storage space for gear. So this is far from realistic, the tent is for maximum four or five people, ideal for couples who want lots of space. In this case you can use the front room as a living room and the back room as a sleeping area. The picture below shows what you have, this is the view from the front room through the huge inner door. Several of the pop-out elements with hubs are visible. The view of the back room with the mesh ceiling and huge inner door. Seasons-wise & climate-wise, they describe it as a 3-season tent and in principle this is true, the tent will protect you from the rain. But the ceiling is all mesh (see the picture above), and you would feel cold in a cold climate. So this is a tent for summer, late spring, and early autumn. They do not provide any info about the waterproof rating, but the tent is very reliable and many users have confirmed that it will not leak. Taking this as a fact, you would not want to use this tent in a windy area. Note that all the walls and the roof are pop-out structures, this is partly visible in the picture above, and I do not think they can withstand lots of pressure from outside. So this is a tent for calm weather camping without strong winds. Weight-wise, the title tells you it is portable, this is the word the manufacturer uses. But this is a heavy tent with its 47 lb (21.3 kg). So you would not really want to carry it anywhere. The packed size is also far from ideal, 63 x 11 x 11 inches (160 x 28 x 28 cm). So you need quite some space in the car to transport this tent. But I still think it is worth the effort. The back view with the small back door and the triangular fly flaps on all the sides. As mentioned above, the bigger part of the frame is preattached. So you have seven hub elements and four fiberglass poles converge to each of them. There are a few more poles that are used for the main door, and a few more are used together with the fly and they create an overhanging structure which you see in the picture below when all those triangular fly flaps are rolled up. This is the tent’s configuration with the fly flaps rolled up. There is no indication whatsoever about the fabric, its denier value, and its waterproofness. Quite disappointing. But it all looks to be polyester and it is very durable, and numerous reports confirm that it is very reliable. There are no floor vents anywhere around, this is not so great but in most cases you would not need them. There are plenty of mesh windows around, plus the front screen room, plus the ceilings in both rooms that are only a mesh. So this should be perfectly enough. Two side storage pockets and four wall-mounted pouch pockets. Not full protection from insects. The price on Amazon is currently around $350, so the tent is a bit of an investment and I am convinced it is worth the money. Weight: 47 lb (21.3 kg). Declared capacity: up to 8 people. Dimensions: 168 x 94 in (427 x 239 cm). Area: 110 ft² (10.2 m²). Area per person: 13.8 ft² (1.27 m²). Packed size: 63 x 11 x 11 in (160 x 28 x 28 cm). As I said above, this tent is unique and a direct comparison with any other tent makes sense only up to some point. In any case, I have decided to show it side by side with two other tents that are 2-room constructions and both have a screen room. But there are big differences in the construction, so it is best that you follow the links for more details. As you realize, it is much heavier than the other two tents, and it is much bulkier when packed, while at the same time its area is smaller. 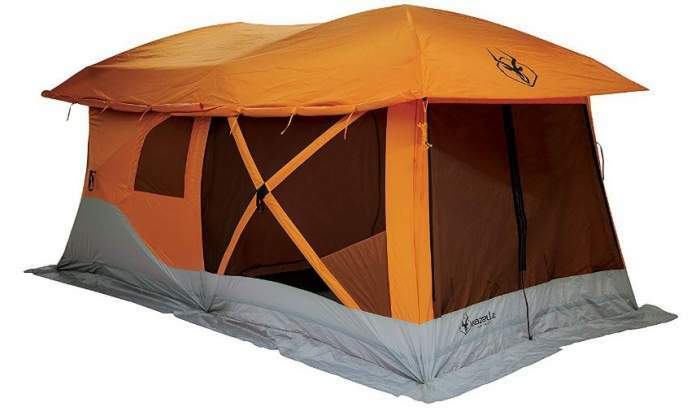 So this Gazelle T4 Plus Hub Tent with Screen Room is indeed a very interesting, unique, and comfortable structure. But bear in mind its weight and its packed size. Many people have had an issue with packing it back into its carry bag. Is it worth the money? I am sure it is, just bear in mind what I wrote above about its best use regarding the climate and seasons. If you would need something much bigger with a screen room, please check this Tahoe Gear Carson 14 person tent. Need a tunnel tent instead? 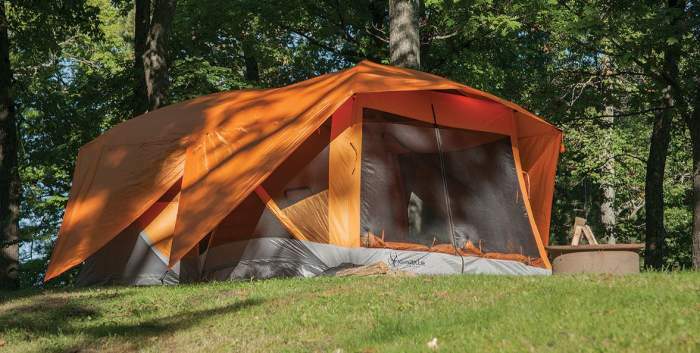 Check this Wenzel Blue Ridge 7 tent. Please note that this is not a sponsored text, I have no relation with the brand and have not received any payment for this text. There is a comment box below so please use it in the case of comments and questions. Have a nice day.